These are opportunities Japan can exploit as it moves from having almost no presence in a rapidly expanding, increasingly globalized, and highly lucrative defense trade market into potentially being one of the market’s most important global players. This would be much like what it managed to do in the 1970s and 1980s when it became a dominant and innovative presence in the global automotive industry. economic risks for Japanese companies that venture into the new defense export arena without adequate preparation or adequate support from their government, which are vividly illustrated in Japan’s recent major effort to sell its Soryu-class submarines to Australia (see chapter 4). Any new national policy, especially in the defense arena, comes with an inevitable learning curve. The highly competitive arms market today makes that curve especially steep for Japan. But when—not if—Japan masters that curve and becomes both an important defense exporter and innovator, much as it did in the automotive industry in the 1970s and 1980s, it can and will emerge as a formidable partner of the United States, or possibly even a competitor, in equipping its allies with defense technologies to make the world safer and more secure. Although often portrayed as an unprecedented “easing” or “lifting” of Japan’s four- decade-old defense export ban, the three principles themselves were actually far from unprecedented, nor were they the first three principles articulated to define Japan’s defense export policy. The first three principles were instituted in 1967 when the Sato administration blocked all defense exports to 1) Communist bloc countries; 2) countries subject to arms embargoes under the United Nations Security Council; and 3) countries involved in, or likely to be involved in, international conflicts. At the time, this would have included Israel as well as Arab countries such as Egypt and Syria. Then, in 1976, the Liberal Democratic government of Prime Minister Takeo Miki extended the prohibition to all areas not included in the three principles, in effect shutting down any and all defense exports from Japan. These included a rapidly changing regional security environment, especially with China’s rise as an aggressive military power. There was also a changing global security environment, as Japan’s traditional reliance on the United States as its primary defender in the event of a major conflict seemed less and less certain—and seemed an artificial and outdated limitation on Japan’s ability to chart its own independent foreign policy course. c)	they are destined for a country that is party to a conflict regarding which the UN Security Council is taking measures to maintain or restore international peace and security. c)	supporting Japan Self-Defense Forces (JSDF) activities, including maintenance of equipment that enhances the safety of Japanese nationals. 3)	Finally, transfers are permitted when there are appropriate formal guarantees regarding extra-purpose use and third-party transfers, which the recipient government must provide to the Japanese government prior to transfer, and to which the government of Japan must give its consent. Just as defense export policy and process in the United States is divided among several government agencies—the Departments of Defense, State, and Commerce—so too does Japan involve multiple agencies, including the Ministry of Defense. In Japan’s case, however, final authority is firmly anchored only in one agency, namely the Ministry of Economy, Trade, and Industry. This has powerful implications for the scope and direction of future defense trade, since commercial and defense export strategies will be more co-mingled than in the United States. It also makes for more unified control over the export process, providing an opportunity for a more coherent and coordinated defense export strategy than currently exists in the US government. There is, however, another player in the defense export policy: JMOD. In June 2014, JMOD issued a landmark paper, “Strategy on Defense Production and Technological Bases.”22 That document, which followed the release of the three principles of defense exports, acknowledged that these principles would significantly change the direction and force of JMOD’s own long-term goal to revivify Japan’s defense industrial and technological base. For example, the strategy paper noted that “Japan’s defense industries must strengthen their international competitiveness to respond to changes” in the international defense market, which is changing rapidly. It also pointed to the importance of building strong relationships regarding defense equipment and technology cooperation with other countries, noting that Japan had concluded broad agreements on these issues with Great Britain in July 2013, France in January 2014, and Australia in June 2014. Such cooperation, of course, presupposes defense transfers from Japan. For that reason, the paper stated, “MOD will formulate a framework which will enable the transfer of defense equipment, with nations that are likely to become partners in international joint development and production.” In addition, “MOD will study the postures and systems for smoothly promoting cooperation under government commitment and oversight throughout the life-cycle of transferred defense equipment.” This clearly points the way to creating a regular government-to-government and/or a foreign military sales program to oversee transfers of Japanese equipment and technologies, i.e., defense exports. Thus, when JMOD’s new Acquisition, Technology, and Logistics Agency (ATLA) was established (figure 2), one of its important functions was to encourage and supervise defense equipment cooperation with other countries. Although JMOD has conceded that final authority over defense exports and technology transfers belongs to METI, it nonetheless sees an important role for itself in promoting these transfers, both as a matter of overall defense strategy and to strengthen Japan’s defense industrial base. 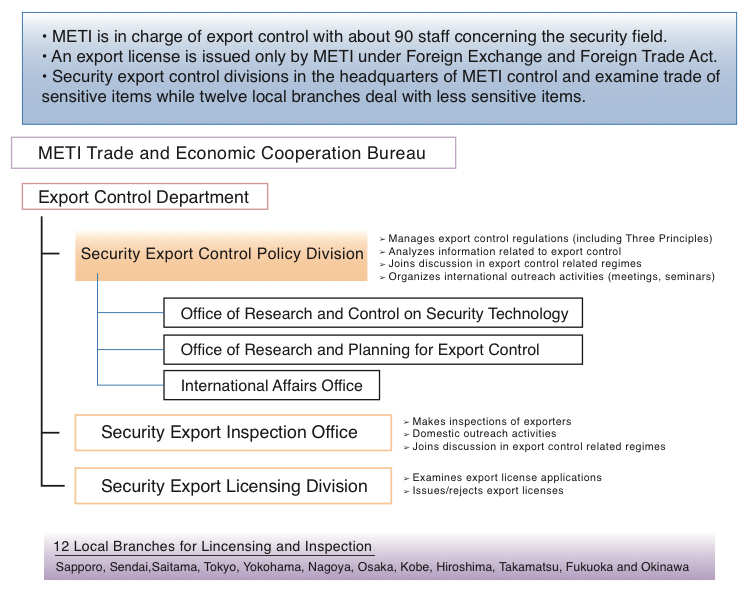 For that reason, several former METI officials were transferred to ATLA to shore up its experience base in dealing with export and transfer issues, including the need for future export controls. The real question is whether they and the rest of the Japanese defense industry are prepared to handle the challenges that this new export policy will present. The international defense trade market is an arena that Japanese companies, with their impressive marketing skills and sophisticated product development savvy, would seem destined to dominate. Global arms sales are slated to rise dramatically in the next decade, especially in Asia. Many countries are looking for systems that are the same as or similar to the ones Japan’s defense companies have been supplying to the JSDF and Japan Maritime Self-Defense Forces (JMSDF) for years (table 1). Whether that prediction was accurate or not in 1988, the sober truth is that today Japan’s defense industry also faces severe obstacles in creating its fledgling defense export market, some of which are of Japan’s own making. 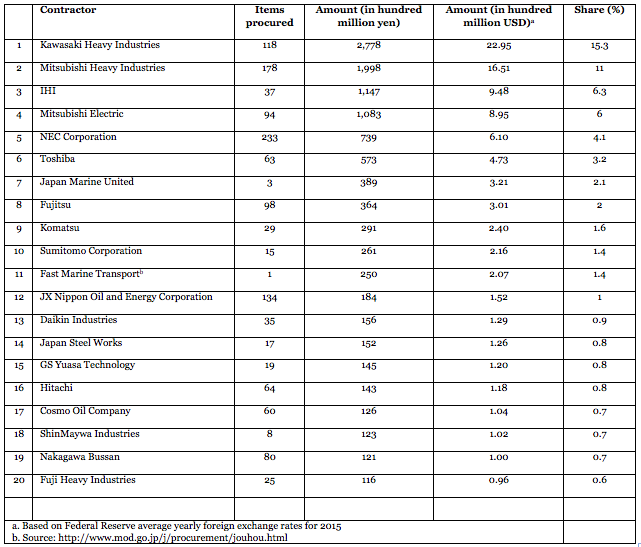 The first is that they are latecomers to the game compared to the United States, Russia, China, or even South Korea. The rules of the international defense market, where every country has its own esoteric import-export restrictions and licensing requirements, are staggeringly complex. Much depends on relationships of trust developed over years and a proven track record. Foreign customers may like the sophisticated features of Japan’s Type 90 battle tank or its OH-1 observation helicopter, but they also like a tank or helicopter that’s been tested on the battlefield, as Russian and US export products have. Another obstacle is that defense is a small share of overall business even for Japan’s biggest defense contractors—barely 4 percent of sales on average, according to Japan’s Ministry of Defense. Even MHI, Japan’s biggest defense contractor (ranking twenty-fifth in terms of world arms producers), does only 5.6 percent of its overall business in the defense market.26 This means that the sale of military systems abroad may not draw the kind of managerial attention and focus Japanese companies will need to penetrate those overseas markets, at least at first. At the same time, in a country that is still largely pacifist, company executives will not like to be branded as “merchants of death” because of their burgeoning defense sales.27 Since Article 9 of the Japanese constitution in effect bans the use of military force,28 a strong culture of anti-militarism and pacifism has been reinforced by decades of quietism in the conduct of foreign policy. Of course, since 1954, Japan has made an exception for the defense of the home islands, and its defense budget remains impressively large for a primarily pacifist-minded country.29 Prime Minister Abe’s reinterpretation of Article 9, and defense spending that is rising to the highest level since World War II, represent important steps. But sales of defense articles abroad that could be characterized as “arms trafficking” are bound to have a negative impact on Japanese companies’ reputation at home, and consequently, there is reluctance at both the corporate and governmental level to tempt bad publicity. Japanese companies accustomed to an anti-competitive corporate culture will face a major challenge when operating in an international defense market that is intensely competitive, with multiple players with multiple skills and capabilities. These include not just the United States, Russia, and China, but Japan’s neighbor South Korea as well as Canada and Turkey. 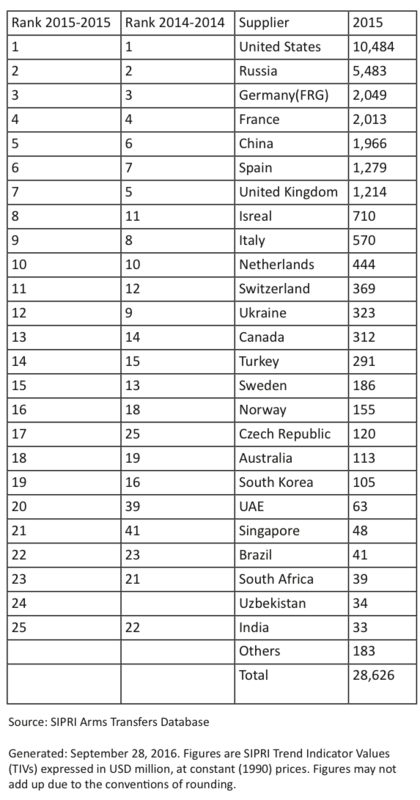 To qualify for the list of the largest arms exporters, Japan will have to double sales every year for a decade (table 2). At the same time, Japan is slated to become a major importer of US arms, with its agreement to buy forty-two F-35 joint strike fighters, even though in terms of volume of American arms purchases, it still lags far behind Saudi Arabia and even India. Yet American defense companies know Japan is one of their most lucrative markets. Already American aerospace firms are lining up for the chance to replace Japan’s aging fleet of F-2 fighters with their own designs, and Japan will be hard pressed to summon up the resources to replace the F-2 with indigenous design and production.31 Furthermore, many of the technologies Japanese companies have employed to create defense systems for the JSDF are actually licensed from the United States, reducing the likelihood that foreign countries will buy Japanese when they can acquire the same technologies directly from the United States, probably at reduced cost. In short, Japan faces many challenges as it tries to find its proper niche in today’s global defense market—just how challenging, two recent examples have revealed. Even before the declaration of the three principles, Japan began pursuing important defense sales to two Asian countries: Australia and India. Neither went according to plan, yet both offer important lessons for future export opportunities. The most important lessons of all may date back even earlier to Japan’s cooperation with the United States in joint development of a defense export product. In July 2014, on a visit to Canberra, Prime Minister Abe and Australian prime minister Tony Abbott signed an historic agreement to jointly develop submarine technologies. This was intended to be the first step in an Australian purchase of Japan’s Soryu-class submarines to replace the aging Collins-class submarines the Royal Australian Navy (RAN) had relied on since the 1990s.32 The deal was the first important test of the Abe government’s new defense export policy and a potential $20 billion sales boost for the Soryu‘s two principal builders, Kawasaki Heavy Industries and Mitsubishi Heavy Industries.33 It was also supposed to be an important step in developing the increasingly close alliance between the two former World War II enemies, Japan and Australia. Then, however, things began to slow down and go wrong. Proponents of the Japan deal replied by pointing out that the Australians would not only be getting access to sophisticated Japanese-designed systems but would also gain the advantage of interoperability with American submarine and anti-submarine warfare systems—something the Collins-class boats lacked. In addition, the Soryu-class submarine is outfitted to take on the most advanced US weapons and combat system programs and components, which were part of a separate contract with a US defense firm. Submarines built by other foreign countries would have no such capability. Australia, by seamlessly integrating its submarine fleet with the US and Japanese fleets, went the argument, would gain an important strategic as well as technological advantage, especially in dealing with a major undersea maritime power such as China. As time went on, however, these arguments lost their force, especially when the non-Japanese competitors proved to be more effective than was previously thought. According to a confidential source, the main Japanese bidder, Mitsubishi Heavy Industries, was forced to restrict access to information about key features of its Soryu-class design due to the JMSDF’s fears that important made-in-Japan technologies might leak out. The turning point came in the spring of 2016, when a commission consisting of retired naval officers and officials drew up its recommendations on the tender. To the shock and surprise of the Japanese government, the MHI bid came in last, behind the bids of French company DCNS and German sub maker HDW. The failure to seal the Australian submarine deal proved politically controversial. An article in Japan Times on June 23, 2016, was highly critical of Abe’s “obsession with exporting submarines to Australia, far removed from strategic diplomatic thinking” and also faulted “the attitudes of government agencies and private enterprises characterized by their blindly following Abe’s single-minded pursuit”43 of an Australian deal. Those government agencies included JMOD and ATLA. Nonetheless, the criticism heaped on Abe, JMOD, and MHI in particular misses several marks. This was Japan’s first serious entry into the defense export arena, with a deal involving a highly complex and expensive weapons system with many moving parts and almost as many political actors. In addition, the navy’s objections to selling Australia the same submarine technologies that Japan had spent decades developing, and on which the JMSDF depends and will depend for at least another decade, may have seriously weakened MHI’s case. Confidential sources have suggested that the failure to take the time to develop an export-version Soryu-class boat that overcame JMSDF’s objections meant that MHI was compelled to be vague about certain onboard capabilities in its presentations. According to sources, the off-site demonstration of submarine capabilities not only influenced the commission’s view of the French versus the Japanese tender bid; it also forced MHI to try a similar selling tactic in the final days of the competition. In September 2015, MHI opened a unit in Australia (astonishingly, no such office had been set up in the fourteen months since the initial deal had been announced). The Abe government began talking about direct investment in Australia in areas besides defense, including creating a lithium-ion battery plant. Then in April 2016, Japan sent one of its Soryu-class boats on a goodwill visit to Sydney. Its captain and crew learned on their way home that the contract had been awarded to DCNS. The bottom line is that Japan found itself outmaneuvered and outsold by countries and firms that had far more experience in the international arms market. If the Abe administration is to be faulted anywhere, it is in its failure to allow more time to prepare for a serious, no-holds-barred competition with some of the most aggressive and accomplished arms dealers in the world. Until the government, JMOD, and Japan’s defense companies manage to conquer the arms sales learning curve, they will probably face more disappointments, particularly in the market for large complex systems. In January 2014, Japan and India announced that they were close to a deal in which Japan would sell India twelve US-2 seaplanes manufactured by ShinMaywa Industries and worth $1.65 billion.45 Although negotiations for this deal began in 2011,46 as of this writing (September 2016), it remains unsigned, and there is considerable speculation that it will never materialize. The problems arising from this defense export, unlike those with the Australian submarine deal, do not spring from foreign competitors or failure to communicate the US-2’s key military capabilities. Indeed, India made it clear from the beginning that it was purchasing the planes for non-military use, such as air-sea rescue and maritime surveillance. Likewise, there was no confusion about whether the aircraft would be built in Japan or India. Indian defense officials have stated that the deal was set to be signed in the first quarter of this year, with the first two seaplanes delivered off-the-shelf and the remaining ten to be built under license in India. Soon, there were other disagreements regarding India’s Defense Ministry offset policy, which requires 30 percent domestic production for procurements from foreign sources. A joint statement by then-Japanese Defense Minister Gen Nakatani and Indian Defense Minister Manohar Parrikar in July 2016 commended the effort made by both countries to come to an agreement on the US-2, but failed to make any further announcements of a pending deal. Some sources say both countries would prefer to let the deal wither away; others say the government of Prime Minister Narendra Modi is still hopeful that some final arrangement can be made. Nonetheless, according to Abhijit Singh, former naval officer and head of the Maritime Policy Initiative at the Observer Research Foundation in New Delhi, “the Japanese, due to their history, are also not fully conversant with global norms on how defense deal negotiations are conducted.” This includes being adept at negotiating the labyrinthine rules and regulations of foreign bureaucracies, which can be particularly tricky in India—but which is a skill essential to doing defense business with New Delhi. But another danger also lurks in both the Australian and Indian cases. Export missteps will complicate or even upset closer alliance relationships. A Japan-Australia-India trilateral alliance has the potential to be a game changer in the Pacific and Indian Ocean security environment. Equally potentially, the loss of interoperability, especially with US systems; failure to achieve announced arms trade negotiations; and misunderstandings and unanticipated complications that breed a sense of frustration and even mistrust could work to the disadvantage of secure relationships with Japan’s allies, even undermining them. Fortunately, this has not been the case with the United States. In contrast to the Soryu-class submarine deal with Australia and the US-2 seaplane deal with India, the Japanese-US joint development of the SM-3 anti-ballistic missile has largely been a success. It contains important lessons for Japan’s future defense exports, but also points to the road ahead on cooperation with the United States. This test was the result of the SM-3 Cooperative Development Project, a long-term joint US-Japan development of a twenty-one-inch diameter SM-3 variant, designated Block IIA, to defeat medium- and intermediate-range ballistic missiles. Aegis Ballistic Missile Defense (BMD) is the naval component of the US Ballistic Missile Defense System (BMDS). The Missile Defense Agency (MDA) of the US Department of Defense (DoD) and the US Navy cooperatively manage the Aegis BMD program. In 2008, Japan began codevelopment of the SM-3 Block IIA with the United States. The twenty-one-foot SM-3 missile, designated RIM-161A in the United States, is a major part of the US Navy’s Aegis BMD system and is a complement to the shorter-range Patriot missile. The intercept velocity of the latest SM-3 is around 6,000 mph, with a ceiling of 100 miles and a range of 270 nautical miles. The missile’s kinetic warhead is a Lightweight Exo-Atmospheric Projectile, a non-explosive hit-to-kill device. According to non-classified sources, Japan is overseeing development of the nose cone, which protects an infrared ray sensor from heat generated by air friction, as well as the second- and third-stage rocket motors and the staging assembly and steering control section for the missile.51 As for the rest of the missile, the booster is the United Technologies MK 72 solid-fuel rocket, and the sustainer is the Atlantic Research Corp. MK 104 dual-thrust solid-fuel rocket. The third stage is the Alliant Techsystems MK 136 solid-fuel rocket. The reasons why the SM-3 Block IIA has been a relative success for Japan’s new export policy compared to submarines and seaplanes—indeed, has heralded the new export policy itself—are many. First, instead of trying to export an entire Japanese-made system, Japan conducted this venture in complete cooperation with the US government and US defense companies, which not only served as technical partners, but because they were more experienced in the vicissitudes of the international defense trade, were able to arrange for sale to Qatar. Second, Japan was working in cooperation with the United States in ballistic missile defense, an area in which it faces few clear competitors, and indeed, an area in which the opportunities for more cooperation and codevelopment are relatively expansive. These include, for example, airborne boost-phase intercept ballistic missile defense. The United States already had a laser airborne system, which it is currently working to upgrade using unmanned platforms. However, there is currently a proposal involving two Japanese companies and a US technology firm for developing an unmanned boost phase interceptor using a conventional anti-missile missile. This could target and destroy missiles fired from North Korea while they are still in their boost phase, whereas land-based systems such as THAAD (Terminal High Altitude Area Defense) and Aegis Ashore do so only in the terminal phase. Third, the SM-3 joint development project was underpinned by very clear formal agreements between the two countries. The first was in August 1999, when the Japanese government agreed to conduct cooperative research on four components of the interceptor missile being developed for the US Navy Theater-Wide (NTW) anti-missile system, for use against short- and medium-range missiles up to 3,500 kilometers.54 In 2007 came the signing of the General Security of Military Information Agreement, or GSOMIA, between Japan and the United States, followed (after considerable delay) by a formal Reciprocal Defense Procurement Memorandum of Understanding, or RDPMOU, in 2016. The United States has similar RDPMOUs with twenty-two other nations, but this was the first such agreement signed with Japan, and it points the way to further defense industrial cooperation down the road. Fourth, the SM-3 project was undergirded by an American desire to encourage Japan’s more proactive defense and defense-trade posture to benefit the United States as well as Japan. Then-secretary of defense Robert Gates was a prime mover in getting the joint development of SM-3 underway and promoting its export sales as an important adjunct to US-Japanese strategic cooperation at the broadest level. But another, even wider field of opportunity looms for Japan-US technology cooperation—and for possible Japanese defense exports. Announced in 2014, the Pentagon’s so-called “third offset strategy” aims “to sustain and advance America’s military dominance for the 21st century” by developing key technologies that will underpin our defense systems of the future.55 These include unmanned systems, robotics, miniaturization, artificial intelligence (AI), and big data, as well as advanced weapons systems such as high-energy lasers, hypersonic missiles, and electromagnetic railguns. As in the case of the first offset (the development of nuclear and ballistic missile technology in the fifties) and the second offset (the introduction of precision-guided munitions, stealth technologies, and digitized advanced intelligence, surveillance, and reconnaissance in the seventies and eighties), the plan is to leverage US technological advantages in the defense sector as a means of maintaining our country’s military edge. In addition, as these advanced technologies approach “singularity,” opportunities to develop them further in conjunction with advanced countries such as Japan will increase, as will the possibility of deploying them across the US alliance system to dramatically upgrade leading allies’ military capabilities at much lower cost than conventional force-building. For Japan, this could represent a major breakthrough both in its own self-defense and in boosting collaborative security in the Pacific region. However, as the MDA works on airborne laser projects as part of an integrated ballistic missile defense system, including boost-phase intercept of missiles using lasers and unmanned aerial vehicles (UAVs), much of the current Japanese research would seem to have important relevance to developing key components of military laser systems. In addition, Hitachi High Technologies has developed a range of ultra-thin wearable sensors, including one that detects the wearer’s emotional states.65 Many of these sensors are for medical uses or for semiconductor manufacturing that requires very high levels of precision. But the versatility and advantages of such sensors for intelligence, surveillance, and reconnaissance at a very granular level, including monitoring the physical state and stress of warfighters, seem obvious. Military-grade composite materials are highly useful for their low weight, durability, and ability to protect soldiers from injury. Today UAVs, unmanned underwater vehicles (UUVs), armored fighting vehicles, submarines, other naval vessels, and body armor all involve the use of composite materials, including advanced carbon laminates and so-called carbon “sandwich” products. As it happens, Japan has been a pioneer in development and manufacture of certain composite materials since the 1960s, and along with the United States, India, Brazil, and China, it is a leader in composite material research. The Japan Carbon Fiber Manufacturers Association includes Toray Industries, Mitsubishi Rayon Company, Kureha Corporation, Nippon Graphite Fiber Corporation, and other leading chemical, oil, and natural gas companies. The Japan Society for Composite Materials, founded in 1975, recently organized its seventeenth US-Japan Conference on Composite Materials at Hokkaido University. Furthermore, Hokuriku Fiber Glass, a manufacturer of glass-fiber products in Komatsu, has developed a fiber-reinforced plastic using traditional Japanese weaving and braiding techniques, resulting in a three-dimensional carbon-weave heat-resistant material able to withstand temperatures as high as 3,000 degrees Celsius (5,432 degrees Fahrenheit).67 This material will be used by the Japan Aerospace Exploration Agency to protect unmanned spacecraft and probes, and its uses for other commercial or military satellite launches or for space reentry vehicles again seem obvious. Indeed, a number of companies in the United States have begun using composite materials for lightweight launch rockets for small “cube” satellites. These materials not only make the rocket lighter but also easier to manufacture, and they can dramatically reduce the cost of a launch. The possibilities of partnering with Japanese companies such as Hokuriku Fiber Glass, which offers the added advantage of composite materials with ultra-high levels of heat resistance, appear promising. In sum, the market for Japan’s defense exports includes many products whose military applications are not immediately obvious but which are both desirable and necessary as part of a US shift to a third offset overmatch of possible future adversaries and are fruitful avenues for US-Japan joint research and development. The most important area, however, may be robotics. Indeed, Japanese economic planners see robotics doing for Japan’s export economy what automobiles did in the 1970s and 1980s. Certainly something analogous may lie ahead in the area of defense-related robotics, which have assumed a new urgency within the third offset strategy model and where the Japanese enjoy several key comparative advantages. Of course, major Japanese companies such as Honda, Toyota, Hitachi, and Fujitsu have dominated the field of industrial and/or assembly-line robots for years—so much so that very few non-Japanese robotics firms have been able to survive, let alone thrive, in this highly competitive global market. Combined with additive, or 3-D printing manufacturing techniques, advanced industrial robotics can bring dramatically improved production precision and performance to the US defense industrial sector, from conventional arms systems to more high-tech systems such as electromagnetic rail guns and directed-energy weaponry. For Japan, the advantages of relying on robots and robotic technology are obvious. In a country with a declining birth rate, robots represent a major “force multiplier,” in terms of both work and quality of life, for an aging population. Yet the same analogy applies to Japan’s military and Self-Defense Forces, where a quality-over-quantity advantage over a possible antagonist such as China makes eminent good sense. It applies similarly to the US military and its third offset strategy, where robotics is not only one of the targeted technologies, but also has enormous applications across the entire field of advanced systems that make up the third offset arsenal, from advanced manufacturing processes to autonomous subsystems of larger networks. For example, while Japan has not directly entered the arena of unmanned aerial and sea vehicles, Japanese robotics companies would clearly offer a range of applications and products that would be extremely useful in further developments in these platforms and their accompanying capabilities. This is particularly true in the defense technology sector, where China has become increasingly active and competitive. “We designed the cheerleader robots to cheer people up and make them smile,” Murata spokesman Koichi Yoshikawa told Computer World in September 2014. “Their features can be summed up as ‘3S’: stability, synchronization and sensing and communication.”71 Those are precisely the characteristics needed for effective swarm systems in the military arena as well, on land, in the air, or at sea. Finally, Japan’s preeminence in robotics will strongly complement the work the United States is doing in AI, in which it has been heavily invested for a decade or more. From Silicon Valley companies like Google and Facebook, to IBM and its mascot AI computer Watson, the private sector has been a leader in the Internet of Things (IoT), big data, and AI expertise. Yet these developments of “human-friendly” robotic capability could complement AI developments in the United States, which emphasize independent creative thinking and “deep learning,” and could even dispel some of the suspicions about autonomous defense systems and “rise-of-the-machines” scenarios. Above all, Japanese expertise in highly sophisticated robotics could provide ideal platforms for AI developments in the future defense sector. Whether the United States recognizes these opportunities for leveraging Japan’s lead in third offset technology is difficult to say and depends on many factors. One of them without a doubt is how well Japan does the job of “selling” its advanced technologies as complementing or supporting similar developments in the US defense sector, and how skillfully it cultivates this potentially huge customer for its high-tech talents. No discussion of Japan’s new defense export policy would be complete without considering the potential risks. While not exactly unprecedented, the new policy certainly represents a major change in Japan’s relationship with other countries, both friendly and unfriendly; with Japanese public opinion regarding weapons and arms; and with Japan’s own defense industry. These risks can be divided into four groupings: political, geopolitical, economic, and technological. In a country that is still largely pacifist, there could be a backlash against the government and the companies involved, which could be portrayed as forming a malign military-industrial complex that profits from conflicts, war, and the global arms trade. This possibility is hardly remote. The campaign to revise Article 9 toward a more proactive defense posture proved highly controversial, sparking a massive media campaign in opposition to the Abe policy, raucous demonstrations across Japan, including in the capital, and even fistfights inside the Diet itself.73 The initial lifting of the export ban did not provoke similar protests, in part because it was overshadowed by the controversy regarding Article 9, but also because defense exports do not have a notorious historical legacy linked to Japan’s imperialist past. In addition, because defense trade has hitherto played so insignificant a part in Japan’s commercial and geopolitical relations with other countries, a merchants-of-death narrative has not gained much purchase for Japan’s biggest defense contractors—at least for now. However, if Japan does become a rising defense exporter, those narratives could be easily attached to the process, especially if Japanese technology is used in a conflict involving the loss of human life. If the Abe government were to fall, such narratives could even inspire a successor administration to push to reimpose the export ban—especially if Japan’s defense export industry is still in a fledgling state, so that halting exports has only a limited or highly marginal economic impact. Even if no such restoration does take place, fear of it could act as a restraint on Japanese companies, preventing them from taking advantage of opportunities that could benefit both their bottom line and Japan’s security. In the worst-case scenario, this self-restraint could become a vicious cycle: reluctance to step forward into the export market narrows the range of options for defense trade in other countries, which means that Japan falls further behind in the global defense market, which in turn limits options for doing business. The result would be that Japan’s defense industry and defense-related companies wind up imposing their de facto ban on exports, to the detriment of Japan and its allies. China sees Japan not only as an economic rival and an obstacle to China’s rise to regional and world hegemony, but also as a potential competitor in the world defense and arms market, one with important comparative advantages in quality and reliability, as well as in advanced high-tech areas.76 Beijing would not at all be displeased to see Tokyo’s new export policy fail. In the final analysis, by far the greatest threat to good Sino-Japanese relations has been China’s ongoing aggressive military posture, especially in the East China Sea and the South China Sea, as well as its failure to rein in the ballistic missile and nuclear threat posed by its client state North Korea. The friction a growing Japanese defense export industry would generate between the two countries pales by comparison. Indeed, a very strong argument can be made that failure to build a strong and effective export strategy, including industrial and technological cooperation with the United States and other allies, will pose more risks than such a policy’s success by diminishing Japan’s capacity to restrain and deter present and future threats from its larger, more aggressive neighbor. These risks come primarily in two forms. The first is the risk of technology transfers, i.e., that Japanese defense technologies will be used for purposes contrary to Japanese national interests. These would include transfers to countries or groups that are committing violence, terrorism, or aggressive actions proscribed by the United Nations Security Council or other multilateral international bodies and/or treaties of which Japan is a member or a signatory. Such transfers are, of course, specifically banned under the terms of the three principles.80 It is assumed that Japanese companies would take the necessary steps to make sure the law is observed and that the Japanese government would ensure that any company or country buying or receiving Japanese defense equipment adheres to the requirements of the three principles regarding third-party transfers (see chapter 1). In addition, a robust industrial-security regime can help to eliminate unwanted technology transfers that are due to industrial espionage or cyberespionage (see below). Nonetheless, there is always some residual risk that Japanese technologies might fall into the wrong hands or be used for purposes that violate international law and offend Japanese public opinion. Therefore, it will be important for JMOD, METI, and other government bodies overseeing the export process to make sure the Japanese public knows that all possible steps are being taken to avoid these risks, and that Japan’s defense export trade is geared to strengthening its allies and the bonds of international peace and stability, as well as its own national security. The second, more complicated, form of technology transfer risk is associated with IP issues and joint research and development with foreign governments and companies, particularly the United States. Many Japanese companies worry that they will lose their IP rights if they engage in joint development or joint venture projects with US companies and the US government, especially since the DoD has a policy that IP or patents created as a result of research and development it funded belong to it and the US government.81 At a February 2015 meeting in Washington, DC, organized jointly by the National Defense Industrial Association (NDIA) and the Society of Japanese Aerospace Companies (SJAC), several Japanese industry representatives expressed this concern, along with fears that even IP developed by their commercial divisions that is used in a system developed or produced jointly with a US defense contractor may be lost. The Americans present (including myself) worked to reassure them that these IP and patent issues can be resolved through negotiation of individual contracts and should not be a barrier to US-Japan defense industrial cooperation. Those worries remain, however, and if they are not addressed in a more systematic way, Japanese companies may be reluctant to enter into joint projects with US defense contractors, even though these may be one of their most lucrative options. One type of economic risk is faced by companies that venture into the defense export arena without adequate preparation or adequate support from the government of Japan. This is vividly illustrated by the Australian submarine deal (see chapter 4),which may have inflicted lasting damage on the reputation of Soryu-class makers Kawasaki and MHI as reliable suppliers of advanced defense systems. This led to one of the most notorious episodes in US-Japan defense industrial cooperation. In 1985, JMOD’s predecessor, the Japan Defense Agency (JDA), began looking for a successor to the F-1 ground support fighter. Two years later, JDA and the Pentagon signed a coproduction agreement involving the F-16 Fighting Falcon, to produce a plane for the Japan Air Self-Defense Forces (JASDF) dubbed the FSX. The agreement, however, came under heavy fire from the US Congress, which complained that the FSX involved too little production for US defense firms and too much technology transfer to Japan—including technologies that Japan could commercialize at US expense. As a result, the agreements were rewritten, with severe restrictions placed on technology transfer and a mandate that US firms would get 40 percent of the production work. The JDA complied, and production of the Mitsubishi F-2 fighter began in 1996. But the clash left considerable bitterness on both sides, particularly in Japan, since the Japanese were convinced the original agreement already leaned too heavily toward the United States. In a Japanese corporate culture where memories are long and the sense of shame and humiliation runs deep, the FSX “debacle” still rankles—and has left residual fears that deeper defense industrial cooperation with the United States could lead to similar confrontations. Again, those fears may be misplaced. The US defense market was very different in 1989, when US companies enjoyed a commanding position thanks to the heavy demands of the Cold War–era Pentagon for weapons and other equipment. With today’s more austere Pentagon budgets, all recognize that foreign sales, and cooperation with foreign defense firms, will be the key to sustaining growth. That necessarily includes Japan, and it is difficult to find any American defense industry official—or indeed any defense official—who is not eager to engage in defense technology and trade cooperation with Japan. In addition, given Japan’s very fledgling position in the defense export market and the fact that so many of its own defense technologies are US-derived, it is unlikely that firms like Lockheed Martin, Raytheon, or L3 Communications will perceive MHI or Mitsubishi Electric as dangerous rivals any time soon. Taken as a whole, development of a strong defense export policy for Japan involves multiple risks and challenges, which can make the policy itself seem daunting. On the other hand, many of these risks can be managed and offset if the new export policy is combined with other changes in Japan’s overall defense trade strategy. These include four significant steps, the first of which is developing a robust industrial-security regime. A modern defense industry cannot thrive in the absence of effective industrial security and cybersecurity. Nevertheless, thus far Japan’s defense sector has managed to function, even prosper, without a formal industrial security apparatus. This is because the unique bonds of trust and honor between the Japanese government and its corporate partners have enabled them to work together successfully even without such an apparatus. For decades, Japan’s defense industrial sector has been focused on indigenous products for the JSDF and licensed production of US systems. As Japan becomes both an innovator in defense products and services and an exporter, however, the lack of a robust industrial security and cybersecurity regime will create strict limits on customer confidence in the integrity of Japanese products and diminish the readiness of sophisticated users to procure defense equipment from Japan. This will have to change as Japan enters the swirling waters of the international defense systems market. It will need a modern industrial security and cybersecurity program to match the present and future capabilities of its growing defense industrial sector. What does a modern industrial security regime do? A robust industrial security regime protects both national and intellectual property and will help Japan work more closely with other allied nations in developing and producing advanced defense systems. First, it contributes to national security by serving as a continuous interface between the government and cleared industrial corporations. Second, it administers and implements laws and regulations relating to a national industrial security program. Third, trained industrial security personnel provide oversight and assistance to cleared contractor facilities and assist management security officers in ensuring the protection of Japanese and foreign classified information. Finally, industrial security personnel facilitate the exchange of classified shipments between the United States and foreign countries and oversee foreign ownership, control, and influence countermeasures in the defense sector. Eventually, industrial security program officers can also provide training and security awareness to ATLA and JMOD personnel, JMOD contractors, employees of other Japanese government agencies, and even foreign governments with which Japan is working on military-industrial and technical projects. All the same, Japan has lagged in implementing an effective industrial security program as provided for in the GSOMIA. This increases the risk of insider threats as well as the possibility that hostile foreign intelligence services will penetrate Japan’s scientific and industrial institutions. Incidents involving either of these would significantly injure Japan’s own national security and deter foreign countries and corporations from conducting further defense business with it, whether joint ventures/codevelopment or importing of Japanese defense articles. Hence, industrial security is one of the issues that must be addressed in order for a strong export strategy to take root. The second step would be to develop an effective Foreign Military Sales (FMS) system under JMOD/ATLA supervision. Defense export trade can take several forms: government-to-government sales, licensing of commercial sales through vendors, or a combination of both. However, the complexity of modern defense systems (such as the Soryu-class submarine) has reduced the relative importance of commercial sales, particularly in developing major systems. For one thing, very few major systems involve a single contractor or even a single “systems integrator” type of defense industrial firm anymore. The majority require careful government coordination and planning in order to assemble the myriad of firms and technologies needed to develop and produce the finished system and then to constantly maintain and upgrade that system in the field, particularly in a foreign country. Hence, export sales place demands that few companies, even the largest, can meet without the help of their own government from the very start. In addition, users want to have guaranteed life-cycle support, training, performance, and product improvement and upgrades that only a government-to-government sale can offer. Therefore, a strong, effective FMS program will become vitally important to building and extending Japan’s defense trade opportunities and will help to prevent failures like the Australian submarine deal. Again, how would such a system work? First, the US experience has demonstrated that no large bureaucratic infrastructure is needed to carry out an FMS program. Instead, JMOD/ATLA would establish representatives in targeted customer countries, such as Australia, India, the Philippines, and the United States. The Japanese government would also want to establish a secure financing and payments program so that the Japanese companies it has approached as part of FMS procurement will know that they will be compensated through the entire life cycle of the program. In a complementary fashion, the government of Japan would also guarantee that customers for Japanese-made systems will have support through the same life cycle, including eventual upgrading and replacement. Finally, an effective FMS system would have an established program of offsets. One purpose would be to encourage customer satisfaction through joint production and development (something lacking in the Australian submarine negotiations86 and not handled satisfactorily in the Indian US-2 negotiations87). Another would be to broaden Japan’s access to foreign markets in both the commercial and defense sectors. This, indeed, points to the third element in export-risk management: defense investment abroad. Under GSOMIA, Japanese investors are able to participate in the US defense market through joint ventures with US companies or as wholly owned subsidiaries, under three forms of security agreements. The first is a special security agreement (such as the one made by British-owned BAE Systems with the US government88); the second is a proxy (used by Italian-owned Leonardo/Finmeccanica to penetrate the US market89); and the third is a security control agreement (used by French-owned Thales in its joint venture with Raytheon90). The existence of Japanese-owned but US-based subsidiaries would also help reduce the perception that the Japanese defense industry is a competitive enterprise that hurts American jobs. Just as Nissan and Toyota have used the opening of auto plants in the United States as a way to promote their image as good corporate stewards, companies like MHI, Fujitsu, and IHI would be able to position themselves as job creators and technology incubators on American soil. In short, moving to joint ventures and/or wholly owned subsidiaries in the United States could help Japan to become a global player and could serve as a powerful platform for speeding technology transfers for Japanese companies. The most effective way to achieve the latter end, however, would be to streamline the entire defense trade process through a Defense Trade Cooperation Treaty (DTCT). foster an atmosphere of mutual trust and information sharing on defense systems between two long-standing allies. The benefits of a similar DTCT with Japan seems obvious. Indeed, such a bilateral treaty makes sense on many levels. The State Department’s Directorate of Defense Trade Controls authorized over $7 billion worth of US-origin direct commercial sales of defense articles to Japan in FY2014, almost twice the value of such sales to the UK and approximately four times the value of such sales to Australia.95 With such an important ally and with trade volumes at this level, it makes good sense to enhance bilateral security by streamlining the bureaucratic process. The benefit of a DTCT goes well beyond direct commercial sales of defense articles, however. It will directly foster deeper integration between the industrial capabilities of the two nations to dramatically increase the quality and capabilities of the technologies available to both partners. Bolstering defense trade between the world’s two most advanced high-tech industries would go far in developing key sixth-generation systems of the future. It would also go far in meeting the Pentagon’s own objectives for a third offset strategy in the areas of unmanned aerial and undersea vehicles; advanced sea mines; high-speed strike weapons; advanced aeronautics, from new engines to new and different prototypes; electromagnetic rail guns; high-energy lasers; and missile defense and cyber capabilities. 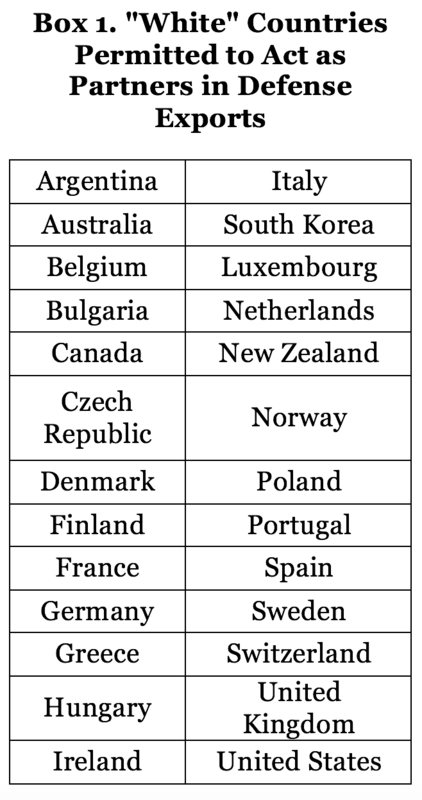 Finally, the terms of DTCT trade with other DTCT countries create, in effect, a Defense Common Market or community of DTCT companies, with the United States, Australia, the UK, and Canada all participating in defense trade more or less as licensing equals. It is even possible to envision other potential DTCT signatories joining the same Defense Common Market, including India. Such a possibility does lie farther in the future. For now, however, an effective DTCT could be a vital cornerstone of a highly successful Japanese defense export strategy—one that matches the promise of Japan’s new defense export policy with the real need for more US-Japan defense industrial and defense cooperation, to the benefit of both countries and other allies. Will Japan be an “awakening giant” in the field of defense exports in the future? What happens will depend on many factors. One of the most important, however, will be targeting the right markets for entry. While Japanese defense officials currently like to think of themselves as exporters and codevelopers with countries like Australia, the UK, France, and India, Japan’s new defense export policy’s biggest opportunity may well be here in the United States. Significant barriers remain. Many would be eliminated through a DTCT that lifts restrictions based on ITAR, which would dramatically increase exports to the United States and open new vistas for US-Japan defense industrial cooperation. After the failures with the Australian submarine deal in particular, the Japanese government is acutely aware that the defense export status quo is not sustainable. One solution reportedly under consideration is to gather all the separate defense divisions of Japanese companies into a single public-private corporation, which would then enter the defense export market as a single entity. Such a solution has a certain bureaucratic elegance, along the lines of the merger of the separate defense equipment agencies into a single agency, ATLA. At the same time, however, such an approach has its own risks. One would be detaching IP rights and patents from the parent company belonging to each defense division. Another is that smaller defense units, such as Fujitsu Defense Systems or Hitachi Defense Systems, would be permanently eclipsed by larger and traditionally better capitalized players—leading to missed opportunities for independent innovation or even for disruptive breakthroughs such as a unit on its own might achieve. Even more important, such an approach would have difficulties separating out dual-use technologies that belong to the mother company. How would Mitsubishi Electric, for example, decide which parts of its electronic component business belonged to its defense division and which to its various commercial activities? Barring Solomon-like infallible judgment, the administrative headaches that would ensue could overshadow whatever advantages come from welding all of Japan’s defense industries into a single defense contracting corporation. What other concrete steps should the current Japanese administration consider taking? One would be to modify or clarify the requirement in the second principle that limits sale and/or transfer of defense equipment to “the active promotion of peace” and international cooperation, or requires that it contribute to Japan’s own security. In a number of important cases, this would limit opportunities for defense trade with countries with which it would be beneficial for Japan to increase military and strategic cooperation but with which it has very limited formal defense ties. Examples would be India and the sale of advanced fighter aircraft or Taiwan and the sale of Soryu-class submarines. 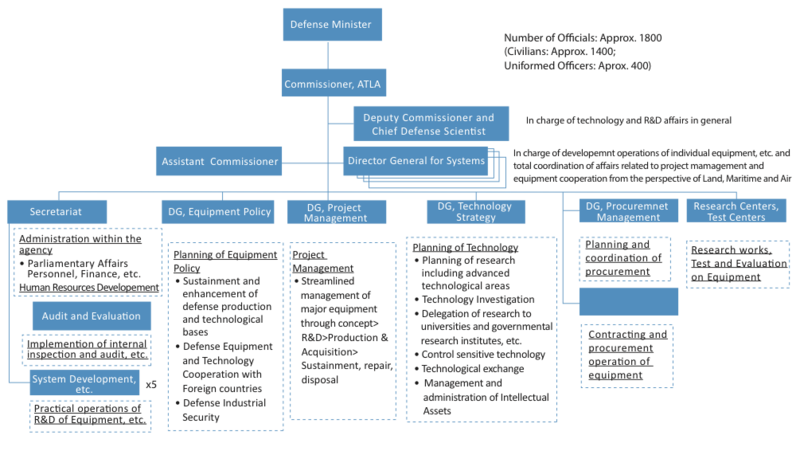 Still another step would be establishing a division within ATLA that is entirely focused on export policy and staffed with METI officials, who could work to identify key technologies for defense export and issue appropriate licenses to Japanese companies, while also establishing branch offices in countries that will be important to Japan’s future defense trade, including the United States, India, and Taiwan. Above all, however, what Japan’s new defense export policy requires to take root and grow is the political will to make it happen. The same political will to lift the export restrictions and to reorient Japan’s entire defense posture, must now enter into the arena of bilateral US-Japan defense technological and defense trade cooperation.